What's the brand of briefcase in The Intern? What’s the brand of briefcase in The Intern? But, like DeNiro’s workmates, you were probably wondering what that super classy and timeless briefcase was that DeNiro’s character was rocking. In this post, we will reveal the identity of this briefcase (you can’t get it anymore) and clue you into some alternative briefcase choices. Don’t have time? Jump over to Amazon and check out our top pick for an Intern-style briefcase. You’ve watched grey-haired widower and retiree Ben Whittaker (played by Robert De Niro) tinker endearingly, but ineptly, with cameras and USB cables to put together an overqualified, heart-warming video application to a young, hip e-fashion startup run by people generations his junior. You watched him take on this new world with surprisingly adept social grace and ease. Watched (and maybe cried with) Anne Hathaway as Jules Ostin, his accomplished and ambitious boss and CEO, struggle to take on the work-life balance and ultimately, with Ben’s sage advice and support, (spoiler alert!) succeed without compromising her relationships or dreams. 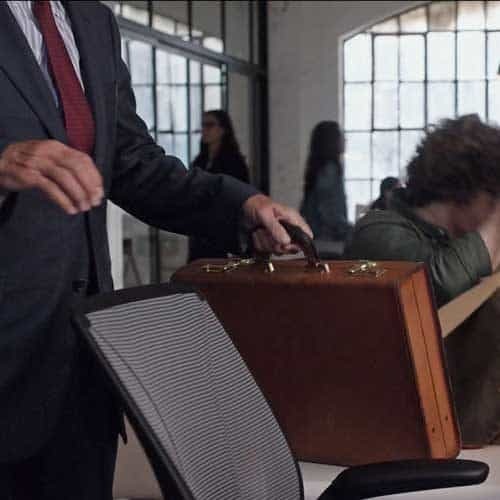 What brand was Ben’s briefcase, and where can I get one? In case you’ve forgotten the briefcase we’re talking about (how could you? ), here’s a quick refresher. Ben shows up daily to work in a crisp, clean, “old-school” suit. Accompanied by his trusty, equally old-school briefcase that houses elegant fountain pens and leather eyeglass cases, he stands out among his younger colleagues who tote more fashionable messenger bags and flashy electronic gadgets. Like Ben, the briefcase seems to a relic of the past, and makes us nostalgic for a classier, bygone era of chivalry and sophistication. Unfortunately, in some ways, the briefcase really is a relic. OMG – they don’t make them anymore? One way to try finding this specific briefcase is to search on eBay. There’s no guarantee they’ll be there or what price you’ll pay, but it’s worth a look anyway. Don’t want to deal with used stuff or eBay tomfoolery? Fortunately for us (aren’t we all, like that co-worker, a little in love with it, too? ), other attache cases are still made today. There are many similar options available, all just a click away. Let’s just see the bags, shall we? Or, at least something close enough to the real deal from the movie? Check out the McKlein USA Reagan Leather Attache Case. For about a Benjamin (give or take), you can have a briefcase nearly identical to Ben’s. Available in either black or dark brown, this model is made with genuine, luxurious, durable leather. The exterior is slim and elegant, and the entire thing weighs just over five pounds. Small feet on the bottom of the case allow it to stand unsupported when placed upright. This also protects the underside of the case from dirt and scratches. But don’t be fooled by the sleek exterior! The interior is also pretty spacious, allowing for storage of a laptop and notepads. The interior is also pretty spacious, allowing for storage of a laptop and notepads. A 3-file accordion-style organizer on the underside of the lid allows for safe, categorized storage of all your documents. A plethora of additional pockets provide the perfect space for business cards, pens, and calculators. Or — because although we want to dress like the gentlemanly Ben, at the end of the day, we’re all more tech-savvy and gadget-reliant than he is — these compartments can be used to store phones, chargers, and cords. To top it off, the briefcase sports a 3-digit combination lock for additional security, so you can have the peace of mind that your valuables are safe and sound. All in all, this McKlein Attache Case is a beautiful piece of craftsmanship that is well worth the investment. Ben would be proud! Check out the reviews and the latest price over on Amazon. On a tighter budget? No problem. The AmeriLeather Expandable Executive Attache Case is an equally sleek and sophisticated alternative at a budget price. Admittedly, this briefcase is made of faux leather. But it is still high-quality, durable material (and, arguably, cruelty-free and easier to clean). With a plethora of color options available — black, brown, dark burgundy, and wine — you’re hardly missing out. The fabric-lined interior is also spacious enough for your laptop and documents. It includes a fan file and compartments for phones, cards, pens, tablets, and notebooks. With a plethora of color options available — black, brown, dark burgundy, and wine — you’re hardly missing out. And just like the McKlein, it features a shiny, gold-toned 3-digit combination lock that will secure its contents. Not to mention, the whole briefcase weighs in at an easy 3.3 lb. Thumbs up on all counts! Head over to Amazon to see the best price and get one for yourself. Perhaps you’re looking for something a little more versatile? We’ve got you covered. The Bostanten Leather Briefcase/Work Bag can be used as a briefcase or messenger bag. Maybe you can’t decide if you want to be old-school De Niro or a young, messenger-bag-toting millennial. (It’s okay, decisions are hard.) Or maybe arm day left you a little sore. This shape-shifting bag is ready for any and all scenarios. Maybe you can’t decide if you want to be old-school De Niro or a young, messenger-bag-toting millennial. (It’s okay, decisions are hard.) Or maybe arm day left you a little sore. Without a hardwood structure, the Bostanten is certainly the lightest of the lot, weighing only 2.60 pounds, and is available in sizes large or small. It is made with high-quality black leather and elegant silver-toned hardware. The fabric-lined interior contains a laptop pocket, main pocket (for files, notebooks, documents), and two smaller slip pockets for phones, wallets, keys, or other miscellaneous valuables. A zipper pocket is located on the front of the bag for quick and easy access. You might not be getting the identical twin of Ben’s 1973 Executive Ashburn. But this handmade, artisan-designed, versatile business bag will prepare you to take on any situation — personal or professional — with class and style. And isn’t adaptability what Ben, a senior citizen intern, is all about? Check out this great alternative to The Intern briefcase on Amazon here. If any of you experienced heart-sinking disappointment when Robert De Niro announced in The Intern that his vintage briefcase was no longer being made, never fear! Online shopping has made a plethora of modern attache briefcase options available at the click of a button. If your budget allows, the McKlein option is a worthy investment: a durable, secure case with a sophisticated, vintage-feel, genuine leather exterior. With its two-color options and combination lock security, we’d hardly call it a dupe — more like an upgrade! Got another option for us? Leave it in the comments below. How to wear a messenger bag on a bike?